It's been a sluggish Monday morning for me - but that's pretty normal after spending a weekend quilting with friends at a quilt retreat. From mid-afternoon Friday to mid-day Sunday, we had no responsibilities and could sew to our hearts content. I'm just sorry I didn't take more photos to share with you! I did some sewing on my sweet grand-daughter's quilt. The layout will not be the Sudoko-style layout I showed you earlier, but I think this one will be a little calmer with a little more white through the quilt. This pattern is one that I marked off to try from Carrie Nelson's book "Schnibbles times Two". The pattern is called Plan C and this is the smaller version of the quilt. I had some coordinating fat quarters I had picked up at a quilt show earlier this year and used them rather than the 5" charm squares called for in the quilt pattern. This one was the triple Irish chain quilt that I have totally fallen in love with! The colours are just beautiful and the fabrics are so pretty! 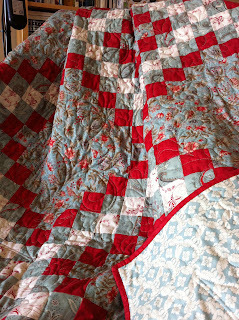 I sewed the binding on the quilt, thinking I would hand-stitch it to the back when I got home, but my good friend, Imogene, picked it up and finished it with her beautiful hand-stitching! Thanks so much Imogene! Do you take your projects on the road? Or have a group of friends that you can share your hobbies with? I love the way friendships grow from shared activities!